Today's recipe is from my dear friend Srivalli'sblog. She is the one who started the Blogging Marathon which is basically a food marathon where we all cook and post it in our blogs according to the themes which we choose to do. We run this marathon every month with different themes. Its almost 61 months since this marathon started and I am part of this marathon since 5th Edition. So glad to be part of this group. Met many bloggers through this group, we are like a family now. Couldn't meet any one personally except Pavani Nandula, but hoping to meet everyone one day. Kalakand is a popular Indian sweet made of solidified sweetened milk and cottage cheese. This dish is originated in Alwar, Rajasthan. A huge pan is kept on a flame and large amount of milk is boiled stirring continuously till it is thickened with sugar and dry fruits. To make thins little easier and to save time I have made this creamy delicacy or milk burfi in Microwave with ricotta cheese, butter, sugar and milk powder. Got this recipe from my very close and dear friend some time ago. Believe me Kalakand which used to take hours of time is just made in 10 minutes. Here goes the final post for BM 61 under the theme "Indian Mithai". Place the butter in a microwaveable bowl and heat for 2 minutes. Once the butter is melted add the ricotta cheese, place it in microwave for 2 more minutes. Then Add the milk powder and Sugar and mix it well. Chirote is a popular and traditional sweet dish from Maharashtrian Cuisine. It is a delicious sweet, dripping sugar syrup in each bite. This crispy and juicy mithai is made with very few ingredients such as maida / flour, semolina (optional) , butter and sugar syrup. Semolina is added to give this sweet a crispy and crunchy texture. In Andhra we use the same process to make Kaaja. In Chirote we cut the into pieces after layering and then roll it to give a poori shape. But for kaaja we do not roll but fry the pieces as it is and then add them to sugar syrup. Here is my Kaaja recipe. Chirote goes to the 2nd day of BM 61, week 4 under the theme " Indian Mithai". In a mixing bowl add maida and sooji mix well and add 3 spoons hot oil. Boondi ladoo is a delicious Indian sweet made on special occasions , specially for religious rituals and for festivals like Diwali and Ganesh Chartuti. Besan / Gram flour is mixed with water to make a smooth batter and poured through a boondi ladle, through this ladle the batter drops down into hot oil like a small droplets which are called boondi. After frying these boondi are soaked in sugar syrup for a while and then given a round / ball shape to make a ladoo. You cant go wrong in making these ladoo if you follow the exact measurements. Usually the boondi ladoo is in yellow color as the gram flour is yellow color. But today am making this ladoo using 3 different colors. This is a special Marwadi boondi ladoo where they make the ladoo with 3 different colors like yellow, orange and green. Its also called as tirange ladoo, tiranga means 3 and we are using 3 colors. Motiya ladoo, motiya means pearls. Because the droplets are like pearls. We think of something and something else happens. Yes, it exactly happened to me today. I wanted to make Sweet potato paratha and made something else. Never made any dish with sweet potato till date, all I did was boil the potatoes, peel the skin and eat as it is . When Valli announced this theme to cook with " Root Vegetables", I wanted to make something different with these sweet potatoes. Thought of making Paratha with these yummy potatoes but I ended up making stuffed poori. I added all the ingredients to the boiled and mashed potato and later realized that I over cooked the potatoes. Tried making parathas but the stuffing was coming out as I was rolling the paratha. Then I thought of making poori and stuff the potatoes and seal it from all the sides and deep fry them. Believe me or not my daughter who didn't want to eat parathas , had these fried poories happily. They tasted awesome. As an important source of Carotene, carrot is widely recommended by physicians for innumerable medicinal purposes. Carrots are a goldmine of nutrients and contain Vitamin A, B and C. Its pectin fiber if beneficial in lowering the cholesterol level of the body. Raw carrots are an excellent source of vitamin A and potassium, folic acid and magnesium. Where as cooked carrots contain 4 times the recommended daily intake of Vitamin A in form of protective beta carotene, besides containing Vitamin B6, copper, folic acid and magnesium. There are huge number of recipes with Carrots. One of which is my today's post, Carrot and Tomato Dal. Toor dal cooked along with carrot and tomato and then tempered with chopped onions, green chilies and curry leaves. This recipes goes as my 2nd post for week 2 of BM 61, under the theme " Root Vegetables ". Today's recipe is a simple one which my mom used to make it. Simple recipe with very few ingredients but never got that taste which mom used to make. 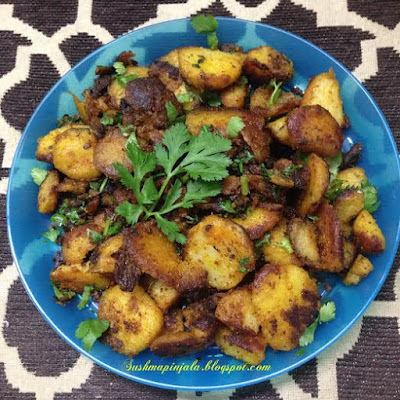 This yummy dry side dish is made with Taro root which is called as Chama dumpa / Chama gadda in Telugu and Arbi in Hindi. This root vegetable can be cooked in several ways. Can boil the taro root and cut and just simply fry in oil or make a tangy gravy curry with onions, tamarind pulp and jaggery. Some times I add boiled eggs too to this tangy curry. You can click hereto see the tangy egg and Arbi curry.